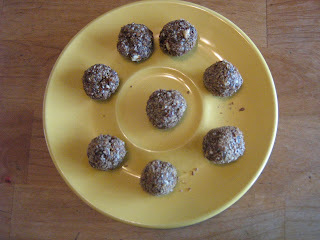 More friends and a blog: Feeling a bit peckish? 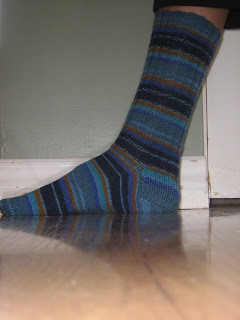 I also completed one sock made with Regia Classic color from Funknits shop on Quadra Island. Yes, yes I know, still have to knit another one before it can be considered a FO, but any knitting progress feels good right now so I am pleased. Anyway, here's a picture of it. Lovely sock, Heather - I will definitely have to knit more socks, and I will be making them longer in the leg - the extra warmth is worth the work. Know what you mean about balls - I finally finished watching Long Way Round last night and that huge vat of animal testicle stew was quite disgusting!!! Samantha - you won't be able to convince anyone of your sweet innocence when you put your comments in writing(not that you had us convinced anyway), now there is written proof of your dirty mind. Love the sock, Heather. Seeing just one sock in your photo made me think of the Barbie clothes post you made using the doll that only had one leg... is this one- legged thing becoming your trademark?